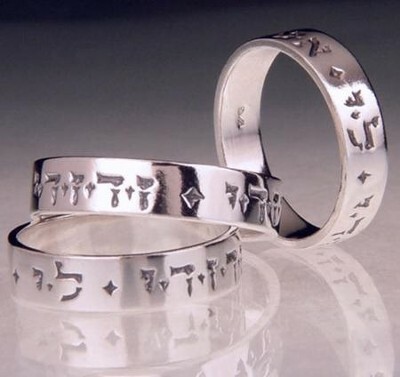 Classic sterling silver poesy ring is richly detailed with Hebrew sentiment I am my beloved's ; taken from the Song of Solomon. Wedding ring favorite in timeless beauty and rich design. 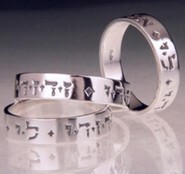 Hebrew engraving ani l'dodi; modern Hebrew quote from Song of Solomon 6:3. Created using lost-wax casting, an ancient method of fine jewelry production; a beautiful ring: romantic, meaningful, and everlasting. Elegantly boxed with explanatory enclosure. Made in the USA. I'm the author/artist and I want to review I Am My Beloved's, Sterling Silver Ring, Size 8.